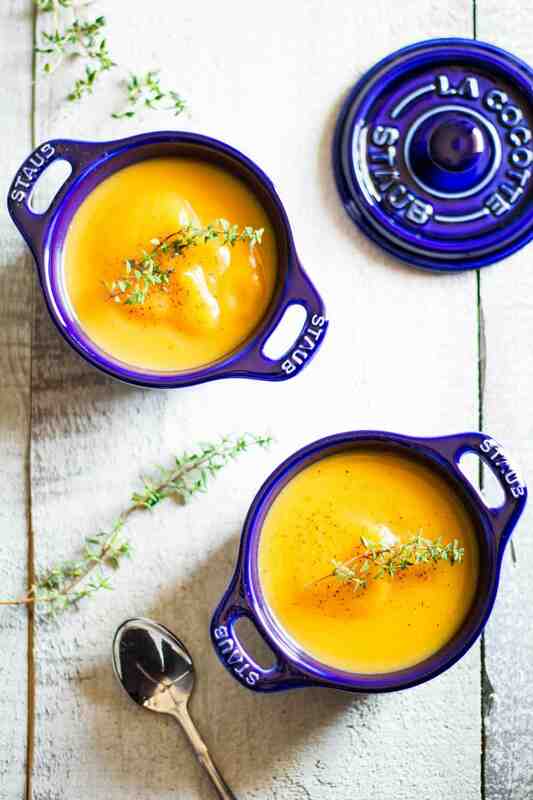 This Roasted Garlic Butternut Squash Soup will convert every soup hater into a soup lover for all eternity. Yes, it is THAT good! It is one of the best soups I have ever created. The reason? Have you ever in your life tried roasted garlic? If so, you’ll be able to imagine how amazing the soup tastes, if not, you have been missing out on one of the most amazing tastes in the food world. Roasted garlic is all soft like butter and nutty and sweet in flavor. Once roasted it is muuuch easier to digest than raw and it doesn’t leave you that wee bit appalling breath many of us dread when indulging in garlic. That means you can eat a whole pot of Roasted Garlic Butternut Squash Soup in one sitting without any repercussions. Isn’t that amazing? I found the cocotte to be perfect for roasting whole bulbs. If you don’t have any, a ramekin with a double layer of aluminum foil on top will also work though. Aluminum foil altogether wrapped around will do the trick as well probably. I try to avoid the use of aluminum foil directly on my food though. It’s always best to use oven-proof ceramic, glass or cast iron to roast your food in. 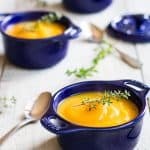 How to make Roasted Garlic Butternut Squash Soup creamy? So, there are several ways to make any soup creamy. You can “add” an ingredient that helps to make it creamy, such as cream, a floury potato, starch or similar. Or, if you don’t want to change the taste too much, the best way is to use little liquid and loads of the main ingredients. In case of this Roasted Garlic Butternut Squash Soup it’s obviously roasted garlic and butternut squash. We basically have a 1.5 to 1 solid to liquid ratio. 1.5 kg of butternut squash and garlic to 1 liter (=1kg) of broth. Use a good blender and it’ll smooth out all bits and pieces and transform everything into the creamiest soup ever. 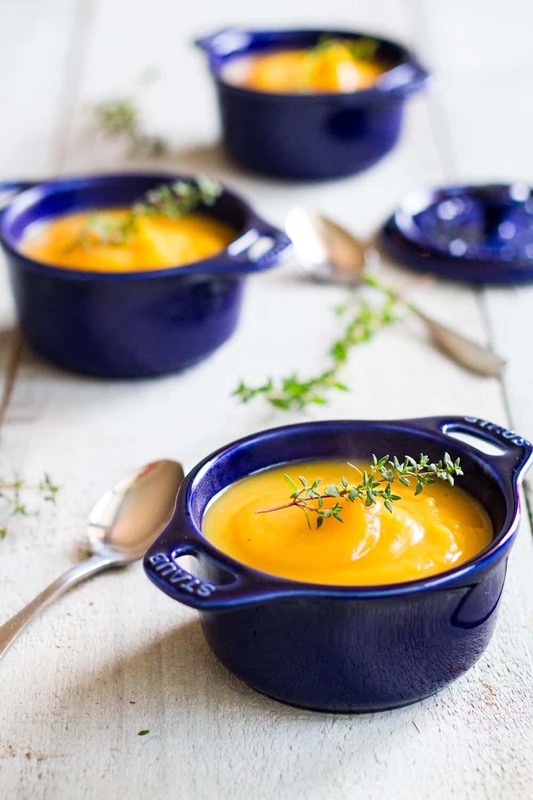 There is no need to peel the squash for this soup. You can simply cut it in half, remove the seeds, cover in olive oil inside and out and roast as halves cut side up and then spoon out the flesh. The roasting will take longer though and you will have to wait for the squash to cool down a little to be able to handle it and remove the flesh. To be honest, I much prefer to peel and dice it and then use a spatula to scoop the squash into the pot. Yes, my fingers are very important to me but my time is too and if I can reduce roasting time by half, I will do so. The garlic bulb I don’t peel. The skin protects the cloves from the heat and keeps them from burning and turns them into butter instead. What other vegetable can I use instead of butternut squash? Literally any squash will do, however, most squashes have a strong flavor and will cover the delicious taste of the roasted garlic. I believe the best replacement is a less flavor-strong root vegetable, such as potato or carrot. I made another soup containing roasted garlic that I’m sure you will love in case you’re not a squash lover (do these people even exist?). The soup I’m talking about is this Roasted Garlic Potato Leek Soup. Peel and deseed butternut squash and dice into 1" pieces. Put butternut squash on a baking sheet, sprinkle with salt and pour about a tablespoon of olive oil on it and move around with your hands to make sure all dice are well coated with oil. Then spread out evenly into one layer. Cut the top part of the garlic in order to expose the upper part of every clove (see video). Place garlic bulb in cocotte and cover. Put butternut squash and garlic in the oven for about 40 minutes or until soft and golden. Take out from the oven and transfer squash (whithout peel if you didn't peel) and peeled garlic into a pot, add broth, 1 teaspoon very finely chopped fresh Thyme and bring to the boil. Once hot, remove from heat and blend with an immersion blender until smooth. Add more broth or water if needed to reach desired consistency. Top with a little pepper and a string of thyme. I am glad I found your website! Awesome healthy recipes! I will try the one by one. I am not a fan of thyme. Do you recommend any other spice? Have your tried fresh thyme? It’s much milder than the dried or ground. Otherwise I would just leave it out completely. Rosemary would be too strong and others wouldn’t really fit. I’m definitely interested in trying this out. What dishes do you normally pair with this? It depends what or who you’re cooking it for. If I want a “light” lunch or dinner I just pair it with bread. If I want it to be a starter I serve less and then make a main dish of protein and salad or vegetables. A lot of people have commented they’re made this soup paired with bread for their vegan and vegetarian guests on Christmas/Thanksgiving and that they were super happy about it. I’ve made this twice since finding your recipe a few weeks ago. So wonderful and simple! Hi Kelsi, I’m so happy you like it. Thank you so much for coming back, commenting and leaving a rating. I really appreciate it!! Thank you Marie :) I hope you’ll love this one just as much. I’m a big fan of butternut squash and I love soup. I need to make this soon! This looks like a tasty recipe, but I assume you meant for the cook to peel the garlic after roasting? You may want to add this for the benefit of novice cooks. Ohhhh, thanks for that tip Becca! I will do that! I am making it right now…nothing like a bowl of homemade soup! Thank you for the recipe. Thank you for a lovely recipe. I used 2 med sized potatoes and added a red long pepper too plus a hint of chili paste… Great soup and so full of nourishment. Perfect for a windy dull day in UK! Thank you for coming back and leaving a comment Pam. You have no idea how happy it makes me when people try my recipes and like them ? 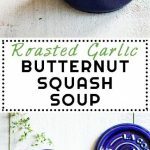 I wondering that roasted garlic butter squash soup can cook in slow cooker? Thanks hope hear from you soon! Not really. Roasting vegetables changes their chemistry. Roasting garlic in the oven makes it turn sweet and nutty and the butternut squash turns sweet, too. You can of course cook it in a slow cooker but it will taste compleeetely different. If you decide to try, leave the garlic out. I doubt great amounts of unroasted garlic taste good in a soup. I had roasted a butternut squash last fall intending to make squash soup in the dead of winter. Did not happen until today. Thawed out the squash and let it drain to see how much liquid there was. Saved the liquid and ended up putting it in the soup, it was very thick. Soup was excellent and the recipe a keeper for sure. Did not have fresh thyme so used 1/2 teaspoon of ground. Hi! I’d love to make this recipe a day (or even two) ahead. We have a vegetarian attending Thanksgiving and I want her to have a special yummy dinner too but with so much cooking I need to get this one done early. What are your thoughts? Absolutely no problem. I had the soup’s leftovers reheated the next day. You can either cook it one day ahead, store in airtight container in refrigerator and then reheat over low heat stirring often, OR you can cook it right now and then freeze it. To defrost, take out of freezer the night before Thanksgiving dinner and let thaw in refrigerator. Then heat over low heat stirring often. This looks great and I am making it tonight! How much broth should be used? All I see is “1 broth” Thank you! This recipe was great! I made it for a dinner party and then again when visiting my parents for the weekend. Compliments all around! Also, I added roasted pumpkin seeds right before serving. Thank you! I just read this comment out loud to my husband because I HAD to share my excitement and happiness. Someone really made one of my recipes and on top of that liked it. Yippy Yeeeey! Thanks for coming back and letting me know. Roasted pumpkin seeds on top sounds delicious!! You made my day Brooke!! Even after two years I still get jumping-on-the-sofa kind of excited when people tell me they’ve made my recipe and like it! Thank you so much for taking the time to comment!! Gorgeous photos! I just want to eat this soup right off the page! Looks perfect for the season. I would marry this soup! All of your photos are beautiful. I want to grab my spoon and dig right in. I love the mini Staub’s too. Good luck with your move! Thank you Ashley!!! How very kind of you to say all this. I can’t believe my eyes whenever I read such kind words about my recipes and photographs. The mini Staubs I found used on a page like craigslist, I was so thrilled to find them there and I never thought they’d still be available because they were announced in JULY. such a simple ingredient list for such a beautiful soup! sounds very flavorful!